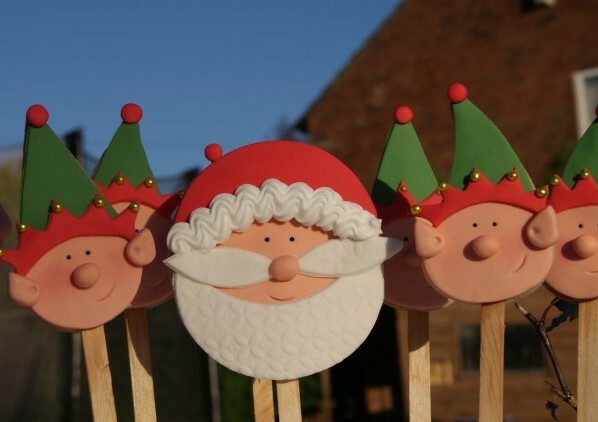 Day 2 of The Pink Whisk 12 Days of Christmas and this year, Father Christmas is being joined by some little helpers – Elf Cookie Lollies! 1 x batch of Vanilla Sugar Cookie Dough recipe here rolled out to a depth of 4-5mm between 2 sheets of baking paper and chilled until firm. 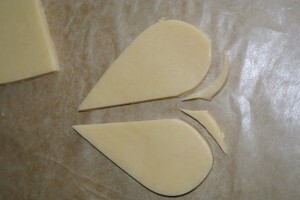 From the chilled cookie dough cut out shapes with the large heart cutter, using a sharp knife split them in half down the middle. Cut out all the cookies you need, and they should be starting to soften off a little. 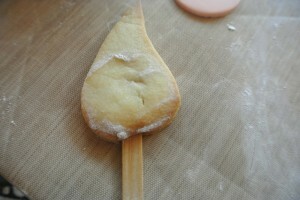 Gently insert a lolly stick into the cookie, through the bottom of the face. With your fingers gently bend the tip of the hat to the left or the right, leaving some pointing straight upwards and set onto a baking tray lined with baking paper. Bob the tray back in the fridge for 10 minutes to firm up again. Preheat the oven to 170c (fan)/190c/ Gas Mark 5 and bake them in the oven for 8 minutes until they’re lightly golden brown around the edges. Leave them to cool fully on the tray as they’ll be soft when they come out of the oven. Once they’re fully cooled it’s on with the decorating! When working with sugarpaste I work on a Non-stick mat which means there’s virtually no need to dust the surface with icing sugar – it does help to keep colours free from the dratted white dust! Of course you’re not all going to have one of those so will need a very light dusting of icing sugar to stop the pieces from sticking to your worktop. Each of the pieces is glued in place with a tiny dab of water using a paintbrush – again, because I do a lot of this sort of stuff I use a Waterbrush which holds a small amount of water in the reservoir and you can just use it like you would a normal brush but without the need for dipping in a pot of water. 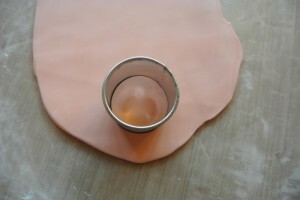 For the face cut out a circle of flesh coloured paste. 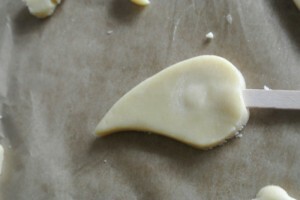 Brush the surface of the cookie with a little water and position the circle in place. 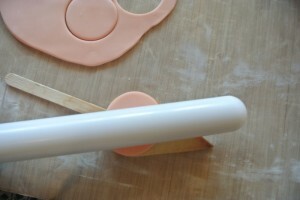 Lightly roll over it with a rolling pin to get the face to fill the cookie. It just eases it out to the right shape. 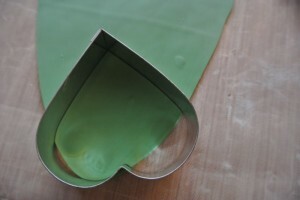 For the hat you’ll need some green, cut out a piece using the pointy part of the heart cutter. Split in in half with a sharp knife. Now using a round cutter, cut away the base of his hat. 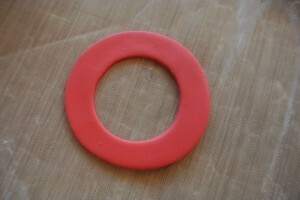 For the hat trim, cut out a large circle and cut away the centre using a smaller circle. 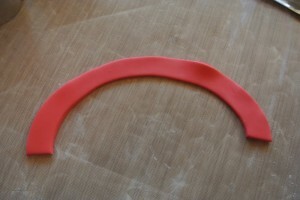 With the knife, cut into the loop and gently ease it out into a strip. 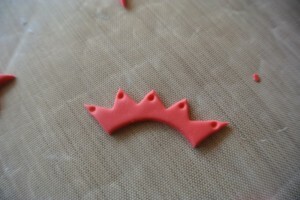 Using the pointed part of the heart cutter create the spikes of the hat trim. 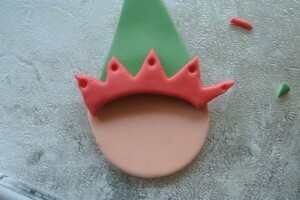 Trim a piece to fit the Elf’s hat and using the wrong end of a paintbrush indent the tops of the spikes. And fit it over where the face meets the hat. Add a tiny dot of water to each indent and gently press in a gold dragee. Using the wrong end of piping nozzle imprint a cheeky Elf smile. Stick on a ball of flesh sugarpaste for his nose. Bit of blusher! 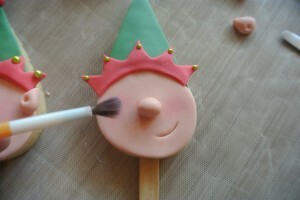 Give him a rosy cheeked glow with some pink lustre dust brushed on lightly with a paintbrush. A ball of red sugarpaste for the tip of his hat – if you grease your hands with a tiny bit of trex, or white vegetable fat, balls of sugarpaste will roll shiny and without a crack in sight. Lastly are the Elfish ears. Two balls of flesh coloured paste, pinch one side of each ball to create the pointy shape and indent the centres with the wrong end of a paintbrush. Stick them in place and Santa’s little helper is good to go – he just needs a full team! These are off to the school Christmas Fair. This entry was posted in Biscuit, Biscuits, Children, Decorating, Gifts, Treats, Twelve Days of Christmas. Bookmark the permalink. Wow love these cookies, going to give them a try! I love these! They are so cute and I love how easy you’ve made it look to make them. Very cute! I might have to try these. so adorable, i need to try making these! these look so cute ruth, you make them look easy to do.going to have to try them. I just love these little Elf cookie lollies they are just so adorable, thanks for sharing them you are truly one talented lady!!! so cute! 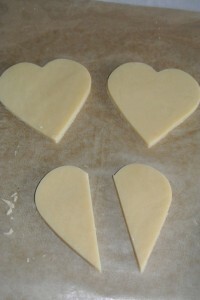 Great that I can use a heart shaped cutter and no special equipment is needed. They all look fab Ruth, but I think my faves are the penguins! Wow these are really cute! Inspired again …..thank you, at this rate I will never get the Christmas shopping done!!! I love these, how cute and creative are they?! These look fantastic. Hope I have time to try making with the kids. I love the penguins! Owls would be good too. These are absolutely adorable! will have to attempt these with my little one although i don’t think they’ll turn out half as fabulous! They look fantastic! Would make great little presents for little ones. My new favourite site! Love it! Brilliant! Not sure I’ve got the time to make them, but maybe next year! These are so lovely. I could never make anything like these Ruth, you are really very gifted! How cut! I’ll make hem, but my granddaughter is a bit too young (18 months) to give much constructive help! Love these. Look forward to having a go at them with Samuel my son. So cute-even I could follow these brilliant instructions. How brilliant are these….! And it won’t be just the kids who find them irrisistible! These look great. Will have a try myself with the kids, they will love it. Oh! My grandchildren will love these! their ears remind me of my sister..
all i need now~ is time! The gals at work would love these! brilliant, another xmas pressie idea sorted, friends will be receiving a box of these on xmas day . Sadly I don’t think mine would look quite that good! These are very cute, I shall have to squirrel these away for a couple of years until my bump has turned into a toddler! My son got very excited seeing these lol!! These look fabulous! And your instructions make them look so straightforward! Just love them – we are going to make them as presents for my daughters friends. Very cute cookies – almost too cute to eat! fabulous cookies. now all I need is the grandkids and then we can all make them. I have 6 grandchildren. 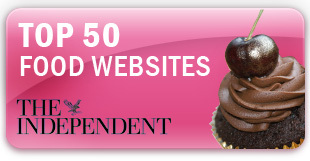 These look lovely – yum! I love these (especially the blusher!). I love the cookies and your easy to follow instructions with pics, as well. These look so cute, I don’t know if I’d be able to eat them! Wow! They look so professional. You really have great ideas. What a wonderfully informative and fun website! So pleased I found you! Looking forward to making these with my little boys, thanks for the inspiration ! wooohoo, this looks fun!!!! thanks for the tutorial!!! I am going to try to make time to make these with my son. They will make lovely gifts for him to give out to our family! Aww how cute. My three year old daughter would love to make these. Wow how clever you are!!! I would love to have a go! I’m inspired now to have a go at making these. Excellent idea for stocking fillers. I will be trying these out tomorrow after my son is home from school. they look good enough to eat!!!!! Thank you for all the pictures, really good step by step. These are so delicate and cute! I’ve never worked with sugarpaste before but I think its time to brave it and give these a go! These are utterly GORGEOUS! Will definitely be giving these a go for my niece and nephew! Brilliant idea and great for getting kids involved. A very clear and easy to follow guide, thank you. So cute and look really easy to make. So cute, almost too good to eat. Really cute – and great directions – definitely going to have a go at these thank you! Love them! And so will the kids! 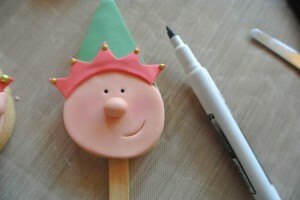 These are just gorgeous; I’ll definitely be making them along with the Santa’s, Snowmen and Penguins! These are so cute & have made me feel all Christmassy!! Will definitely try them out! So cute! I tend not to use sugar paste but I’ll have to try them when I have more time (starting a Christmas baking list for everything I want to do). Wow, how do you make them look so easy! 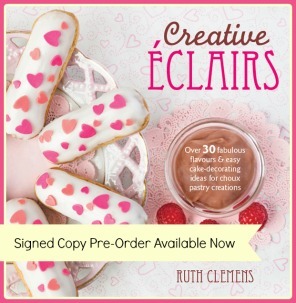 I love your step by step instructions, they help so much when trying to recreate artistic treats! These are so cute. Not sure I’d have the patience. These elf cookies are so adorable! looks like someone I know! 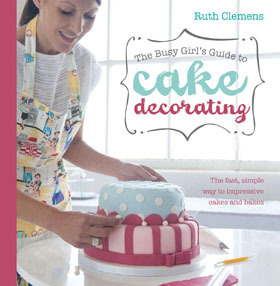 Thanks Ruth – I’ve tried cake pops before and made wa..ay too much mess (they tasted good though!) 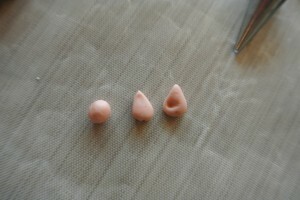 these look a bit more manageable – sugarpaste is just like playdoh-and I can do that! Another lovely idea and such clear instructions I may even have a go! Awesome! our elf on a shelf – Mr U.L Tide will enjoy making these with my son this week ! The decoration on these is just fabulous. Somehow you make it look easy too, which amazes me! These are so cleverly made, my kids will love them. These look fab and are a great alternative for kiddies who don’t like mince pies! Another fabulous recipe, I am going to be busy!! My kids can’t wait to try them! What charming cookies, and a fab tutorial. These are really lovely – great for kids! We do baking with our nursery class of children with severe and complex needs, am going to take this recipe in for us to bake for our Christmas sale morning. Thanks!! These are brilliant. I am going to try and make some with my daughters. These look so impressive! I can’t believe they are cookies. Very nice! Wow, they are so clever and cute! easy and cute! Great for kids and big kids! These are gorgeous. It will be a great activity for our school children on the last few days of school albeit scaled down somewhat. Give them some artistic license! I’ve made some of your lollies before and they came out great – cannot wait to try these! These will be great to take on christmas day when we go visiting. Easy to wrap in cellophane to make even prettier and transport. Am totally going to make these this year! So…. 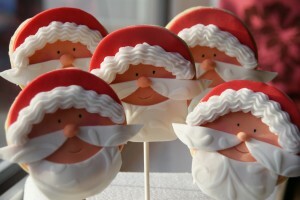 Cute…The ever cutes Santa & Elf lollies. Yum..yum I want a bite. Day 2, elf fun is done! 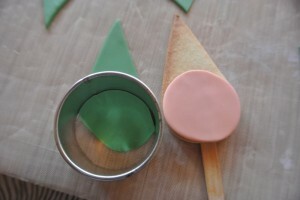 Very clever and excellent guide Ruth – wish I had a little one around to make them for! 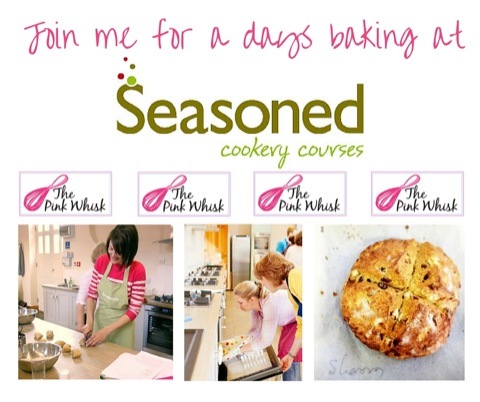 Absolutely love your website, have made a lot of your recipes and love the step by step instructions. These look amazing and the tutorial is fab making it look almost easy for a complete novice to achieve. These are so adorable! I’m definitely going to try making them, great instructions too makes it seem not too daunting to have a go! They are so cute! I’m definitely going to have to have a go at making them. NO ONE can possibly eat these! They are ridiculously cute! Cute, and look as if my copies will be similar! I love these, they are so cute and the full recipe and photos are brilliant with the step-by-step instructions needed by the eternally hopeless bakers like me! I love the cheeky little elves! I will be making these for my two god-daughters. Are they cute or what!!! Very cute, don’t think they would last long. 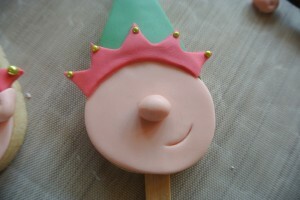 These lollies look great, I think I will have to make them for the kids as well as the little ones !!!! These are so pretty – can’t wait to try them! My grandsons will LOVE these!!!! Wonderful, great for the kids, you have the recipe licked! Love it. Santa-stic!! Having watched my 1st Christmas film, the kids and I are loving the elves! Suspect with my little helpers I won’t make them quite so lovely, apologies to teacher now! 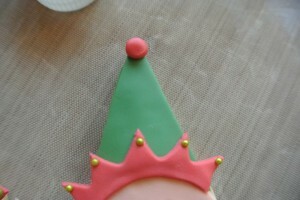 Very cute and the way to make the elf crowns is ingenious! These look fab to make with the kids. I hear the cookie monster coming look out! ha fab, i want these!! They are adorable! Might have to give them a go for my Christmas party! I wish you were a mum at my school! Top quality winter fair produce! OMG! Those elves are just fab! 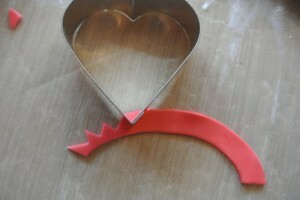 I love the clever use of the heart shape cutter and the piping nozzle! No need to buy special cutters… Good thinking Ruth ! These look lovely, have never been tempted by cake/biscuit pops before but I might have a go! Ab Fab – am going to have to make these for my friends husband who works in? Yes you’ve guessed it – Elf and Safety! These look great,I will make them for my twin grandsons birthday party on December 15th!! Such cool cookies! I tried the santa ones last year and will be onto the elves asap! Such a wonderful idea, certainly have a go with my little brother! You always make it look so easy! I love the step by set pics. So sweet, although I think my elves will look a bit more wonky! These are so cute, I might just have to give them a go. These just look fab – I think a Christmas treat for my Cub pack!!! They look great, thinking of making some and tweaking to make Ben Elf and Holly as my daughter loves them! Fab idea and they look like a good activity to do with the kids in the run up to crimbo! bagsy the hamper’s mine! lol!!!! Adorable and looks much easier than you’d think (plus would make the girls happy!) – great! Going to try them for the school fair! These are brilliant, you make me feel I could make them. 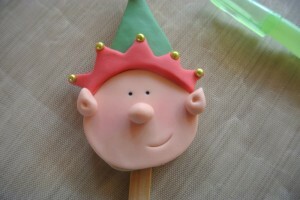 Will be the bestest granny making the cutest elf cookies lollies !’ We all want to be the best!! Think I’ll be a winner here with them!!! OMG I love these! Will defo be giving them a go as this year I am only giving out edible presents! All handmade, so much more personal and thoughtful I think. What a great way of doing it. Amazing festive Lollies!! Will certainly be making these!! These are so cool, my kids would love them. Why does anything on a stick always taste good??? 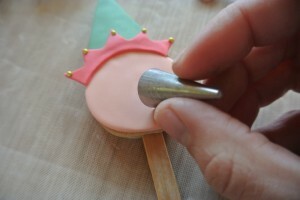 Wish I could do that but nothing I make on a stick ever works out, my cake pops always fall off and crumble…. baa humbug! My 3 year old would love these! So cute. Hello – I love your tutorials especially your brilliant use of all the cutters, I’m going to give these a try for my daughters christmas fayre this Friday and if these fail (which I’m sure they won’t after this) I can fall back on your chocolate tray bake which is always a big hit. These are too cute! I can see a batch of elves being sent in for the crimble fair! I love these, I recon the elves are possible a little out of my reals of tidy baking but I recon I can manage some snow men or even the penguins. Can’t wait to give them a try, but must ice my Christmas cakes first! These look fab. 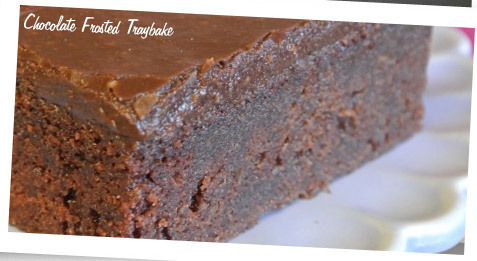 I made your Chocolate Tray bake again this weekend – yum yum big fat bum! Very festive – love them! Lovely cookies, plus Elf is the best Christmas film ever. These look really nice, a great idea for the kids at xmas time…and your tutorial lays it out really simply. These look fun! Way better than a round cookie anyways! I don’t know how these ideas ping into your head you are amazing! Those look amazing – my girls will love them! These are adorable. I think I will suggest to my son that we make some and give one to his pixie friend (don’t ask) for Christmas. Thanks for the instructions. Lovely! I shall be making a batch of these I think! The penguins are soooo cute!! These cookies will be lovely for my children’s friends at school!! I will give them a go!!!! They are so cute! Good stuff. I know a few kids who will love these including those who are only young at heart! Love these cheeky chappies – very imaginative use of a heart cutter! Not sure my artistic capabilities will stretch this far but will give it a go with your fantastic tutorial. Super cute!! Can’t wait to give them a go with my little elves!! what a fab update on the snowmen from 2 years ago – hope these are as fun to make. Too cute, will defo be having a go at making these! OMG how cute are these! Hello again. Why have all my poor children got coughs. Maybe these lollies will help. he he how cute, i was going to make the snowman ones u did for school but now i might have to do elves !!!!!!!!!!!! These would be fab for the school Christmas fair. My twins reception class are all going to be elves in their play, so I plan to make each class member one of these from the girls :)That’s when I’ve finished making their little elf costumes……. Fab idea to make with my nieces. Loving the elf ears especially! I Love these! I wish I had the time to make them. I still need to ice my cakes, make my mincemeat and the mince pies and I haven’t even started wrapping the presents yet. fantastic lollies – can’t wait to try them! can you clarify what sort of lolly sticks are required – do these need to be cookie sticks or can they me normal lolly sticks. In your other receipes for cookies lollies there are links to your store’s Wilton’s lolly sticks – but these specify that these are not to be used for the oven. Thanks for your reply. Love your receipes and the fact that you have step by step pictures, that’s so useful. I have been trying to find a decent biscuit recipe since a disastrous batch I made following the instructions that came with my daughter’s cookie cutters she received for her 2nd birthday in October. Just tried these and they are yummy! My friend couldn’t believe I made them. Thanks so much. Awww these are so cute! I had a go at the snowman ones last year, they went down a treat! I made the snowmen ones as biscuits not lollies last year and was amazed how well they turned out. So will it be elves or Santa this year?! I could have these with the champange from the hamper! A work of art – and I cant wait to try this recipe. No kiddies in my house, but who cares !!!!!! Very festive. Great for school presents for Xmas. Super cute! I wish I had the patience to make more than a few! My oh my – so irresistible, Ruth! These are really cute! 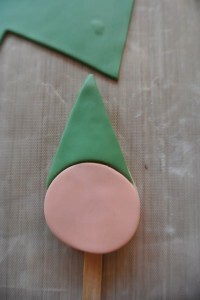 Do you make the coloured fondant yourself or is it self bought? I think the faces are soooooo cute, do you think they’d work on cupcakes or would the cookies/larger cake be more appropriate? These are so cute and taste yummy! Might also pinch the way you put the faces together for some Year 2 felt craft decorations at school – that way your designs will live on year after year ! Kids love these ! Thanks! How fun, kids would love these! Great instructions – look easy to follow – thank you! Literally making me broody. Want to have kids just so I can make these for them! If I have time amongst all my other Christmas baking I’m sure my little girl would love these!! Ideal for the kids at the Christmas Fair. One to try with my daughter and nephew at the start of the school holidays – its becoming a tradition, last year we made mince pies and at Easter we made your Cream egg Chicks!! Love these! 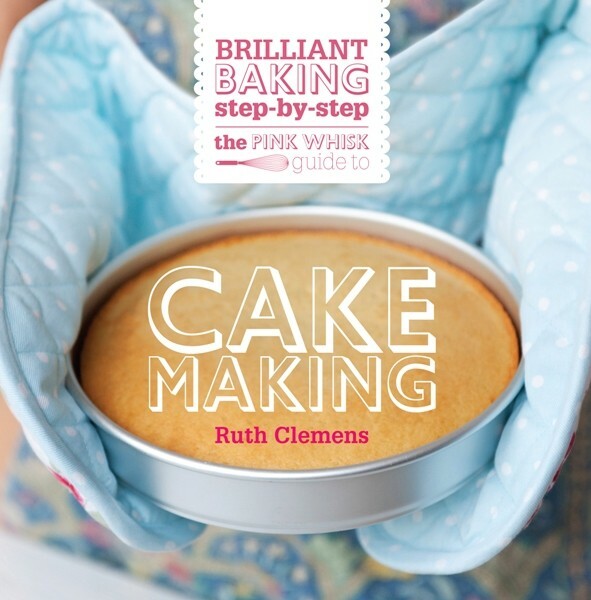 You just make everything look so easy Ruth and it gives me confidence that I could actually try and make them! I think these would look brilliant sticking out the top of a stocking on Christmas morning! How cute are these? Almost makes me wish I had children so I could make some for the school bake sale. 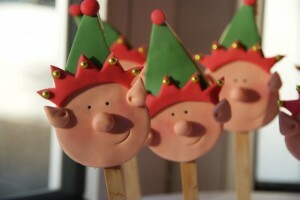 Will have a go at these for my kids xmas parties…soooo cute! 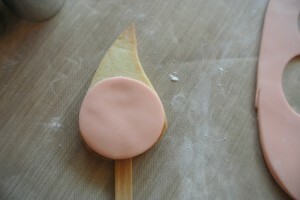 I caught the cookie lolly bug from The Pink Whisk. They’re such fun to make. Everyone loves them!